These moments have made the World Cup Hall Of Fame. Do you remember them? Now you are showing your age. Maybe it is time you started a pension, it is not too late! Need advice Frank Ryan Financial Services can help. Contact Frank today, he would be happy to run through all the different types of Pensions available and which one suits you and your family best. Don’t put it off any longer. 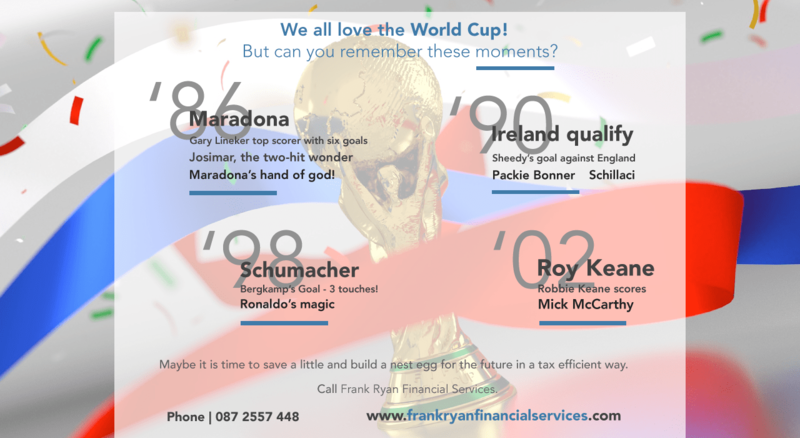 Call Frank on 087 2557 448 or email Info@Frankryanfinancialservices. and you can also Contact him through our website here.